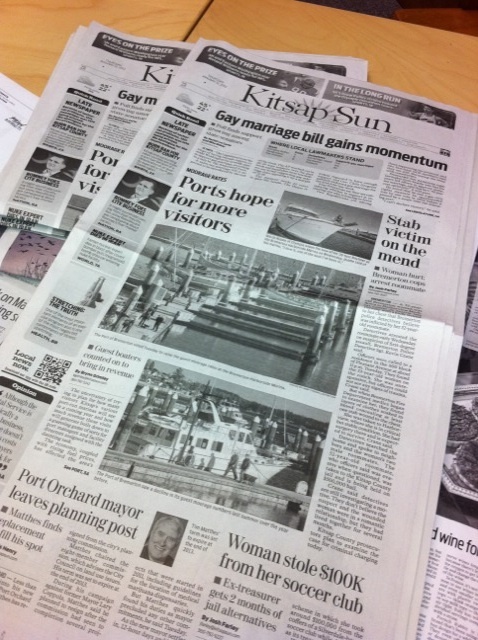 My son was reading his tweet from the Kitsap Sun as I was reading the paper this morning. “Didn’t you notice that the paper is in black and white?” he asked. “No, I didn’t notice until you mentioned it”, I said. It looks fine to me. I don’t mind the paper being in black and white at all, just as long as the online version is in color. At least this person received a paper. It’s just after 1pm & I still have no paper – called the Sun as requested at the end of the editor’s remarks. The circulation rep was non-apologetic and not forthcoming with any details, except to inform me that “looks like we will not be able to get a paper out to you today”. I was offered a one-day credit or the option to receive both the Thurs. & Fri. editions on Friday a.m. I chose the latter – will see if that really happens. I am curious what the decision-making process was for deciding who would get a paper today – late or otherwise? I am close to canceling my paid-in-full year’s subscription – not because of today’s late paper; I understand that “stuff happens”, but for “customer service” to not even offer a lame excuse, much less a valid one, for why “it looks like we will not get a paper out to you today” is NOT customer service. This, with the fact that I have begged for my paper to be delivered in plastic during the rain – since resubscribing at the end of Nov., I have not had a single paper delivered in plastic – and we have been thru some nasty wet & windy days during this time, leaving me with swollen and soggy papers. I enjoyed the retro look. Thanks for the explanation. No apology is necessary. I don’t know of any human activity that goes according to plan 100% of the time. It’s after 1:00 PM and I still have not rec. a printed Thu. paper. It’s 4::40pm, and we still haven’t received a newspaper on 3rd Ave. in Suquamish. The number you give leads to voice mail hell, asking for an extension or a staff person’s name. Lacking a paper, I have no clue about either. Frustrating. I’m a little late with this, but I want to thank the editor, the staff and our carrier. I think you should have used the name of that company that wouldn’t support you at odd hours. I love the story about calling for help in Belgium. We appreciate what you said about the carriers. Ours deliver other papers, too, so I expect he had to make the route twice that day. He actually called us to let us know he had just put the paper in the box. We’re on a hill with a 500-foot driveway, so it’s not easy to run down and look.